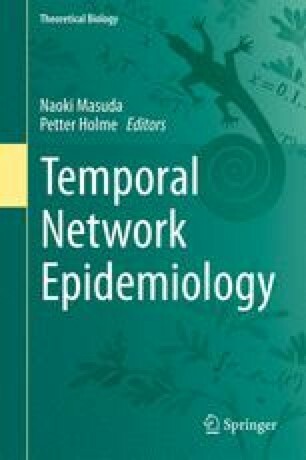 We analyze an empirical, temporal network of livestock trade and present numerical results of epidemiological dynamics. The considered network is the backbone of the pig trade in Germany, which forms a major route of disease spreading between agricultural premises. The network is comprised of farms that are connected by a link, if animals are traded between them. We propose a concept for epidemic surveillance, which is generally performed on a subset of the system due to limited resources. The goal is to identify agricultural holdings that are more likely to be infected during the early phase of an epidemic outbreak. These farms, which we call sentinels, are excellent candidates to monitor the whole network. To identify potential sentinel nodes, we determine most probable transmission routes by calculating functional clusters. These clusters are formed by nodes that – chosen as seed for an outbreak – have similar invasion paths. We find that it is indeed possible to group the German pig-trade network in such clusters. Furthermore, we select sentinels by choosing nodes out of every cluster. We argue that any epidemic outbreak can be reliably detected at an early stage by monitoring a small number of those sentinels. Considering a susceptible-infected-recovered model, we show that an outbreak can be detected with only 18 sentinels out of almost 100,000 farms with a probability of 65% in approximately 13 days after first infection. This finding can be further improved by including nodes with the largest in-component (highest vulnerability), which increases the detection probability to 86% within 8 days after first occurrence of the disease. This work was supported by Deutscher Akademischer Austauschdienst (DAAD) within the PPP-PROCOPE scheme. FS, AK, and PH acknowledge funding by Deutsche Forschungs- gemeinschaft in the framework of Collaborative Research Center 910. The work is partially funded by the EC-ANIHWA Contract No. ANR-13-ANWA-0007-03 (LIVEepi) to VC.